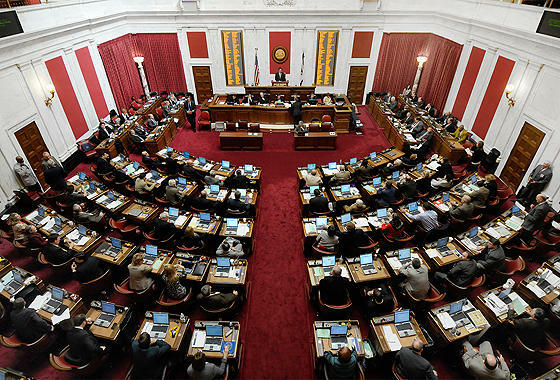 West Virginia's House has passed a bill that says clergy in the state don't have to perform marriages that don't conform to their "sincerely held religious beliefs" and cannot be sued for refusing. Judiciary Committee Chairman John Shott, a Bluefield Republican, says it clarifies the law though he was aware of no such lawsuits in the state. Delegate Mike Pushkin, a Charleston Democrat, says the First Amendment already protects clergy against such infringement on beliefs, and the bill is an attempt to "pander" to what some lawmakers see as "an intolerant element in their own base." Delegate S. Marshall Wilson, a Gerrardstown Republican, says a quick Google search produced an article about an Idaho city ordinance telling pastors to perform gay marriages or go to jail. The bill passed 90-5. Read the bill here.